With each new National Executive Board term comes a renewed sorority focus. 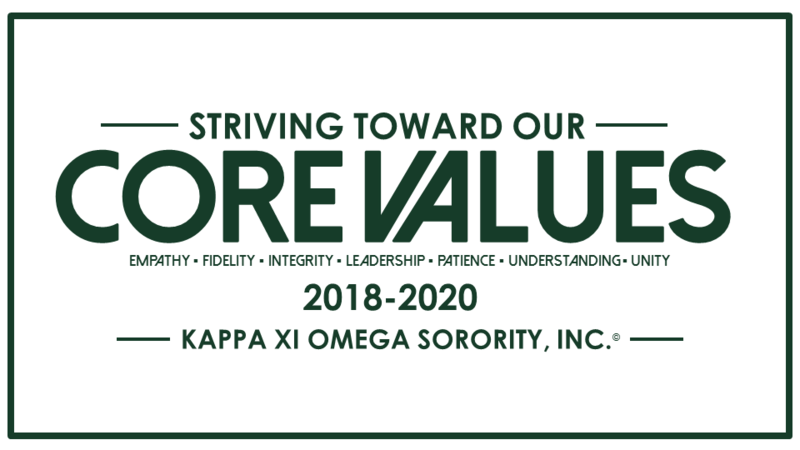 We are excited about our 2018-2020 focus: STRIVING TOWARDS OUR CORE VALUES. Together, Kappa Xi Omega’s members will work to demonstrate, in both tangible and intangible ways, the founding principles of our sorority – empathy, fidelity, integrity, leadership, patience, understanding and unity. This goal will be reached through the implementation of sorority programming directly connected to one of our core values. We are excited to introduce members and non-members to new activities and initiatives over the next two years. A sisterhood with active members throughout the United States.